On the occasion of the first anniversary of 9/11, Rajiv Vora’s editorial in the journal Gandhi Marg brought out the other side of it- the most revealing coincidence, birth of Satyagraha on the same day in 1906 in Johannesburg of South Africa which showed the world the path of deliverance from the rationale of violence and counter-violence. It is a most unique story. Muslims were on the forefront of the birth of Satyagraha under Gandhi’s leadership. Birth of Satyagraha symbolizes what the unity between Hindus and Muslim in higher vision of life can give to the world. 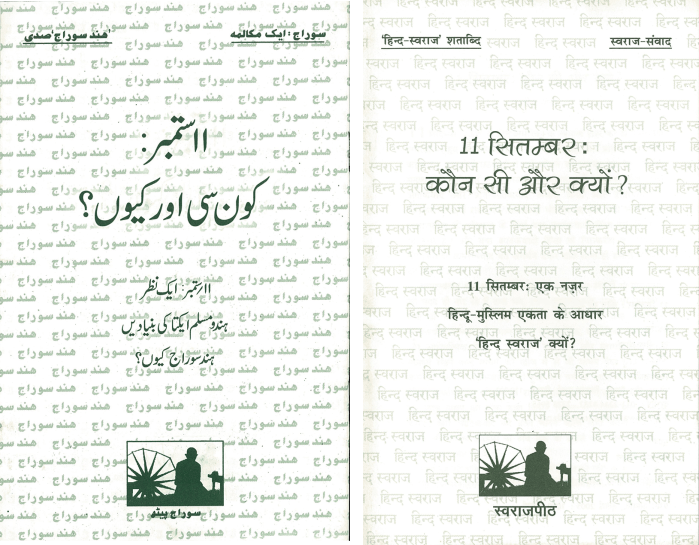 This started Swaraj Peeth’s interface with Muslim community, some of their leading lights like Late Maulana Anjar Shah Kashmiri and Janab Sayed Hameed- two of the most respected noncontroversial names among Indian Muslims; their youth in Western UP, who got interested in the great legacy they must own up and act upon to present an answer to their post “nine eleven” demonization.